My chain broke so I decided I'd fix it. Don't have a tool to take apart the chain so I tried hammer and a nail over a wrench to no avail. Messed up the chain pretty bad too. Is there such a chain where these are welded? I smashed this thing with a hammer as hard as I could right in the center with a nail and it didn't even so much as budge. I will get a dedicated tool but I'm just baffled at that. 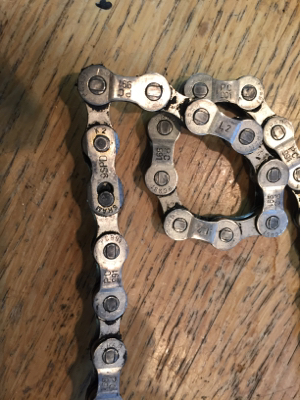 Do I get a new chain or just sever a couple links and get replacement pin? I'd get a new chain and use a chain tool next time. The links have rivets in them which are hard to push out without a chain tool (and other tools can weaken the chain leading to failure, especially with a cockamamie way like you're trying). Given that a cheap chain tool is 10-15 dollars it's a worthy investment relative to the cost of a replacement chain. In the second picture, the second vertical link from the top is a quick link. You push the plates together (perpendicular to the table) and then push them in opposite directions (parallel to the table in the direction of the chain). You will need a chain tool anyway when you get your new chain in order to size it appropriately; this link will give you appropriate directions. And if you have to install a special rivet (e.g. Shimano) to close the chain, you'll need a tool (*). (*) On lower speed chains / old days, people used to push the rivet out partially then re push it back in to close the chain. 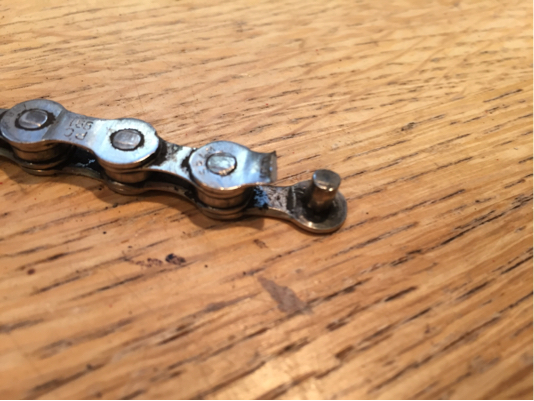 It is now recommended to use the special closing rivet or a quick link, depending on what the chain manufacturer suggests. Not the answer you're looking for? Browse other questions tagged mountain-bike maintenance chain or ask your own question. Chain shortening only one link?